A ban on smoking in public places - including bars and restaurants - has come into effect in Scotland. It is being hailed as a step forward for health but critics say it will cost jobs and infringe human rights. More than a fifth of smokers questioned in Scotland plan to flout the ban, which came into effect overnight, a poll by BBC Five Live suggests. The impact will be watched closely in England, Wales and Northern Ireland, where bans have also been planned. Last month MPs voted in favour of a total ban on smoking in enclosed public spaces in England, which is due to come into effect in the summer of 2007. Northern Ireland is introducing a ban in April next year, while no date has been set yet in Wales. 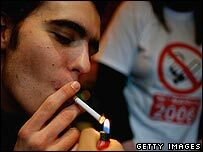 BBC Radio's Five Live programme discovered that about 21% of smokers surveyed in Scotland planned to ignore the ban. A total of 1,000 adults throughout the country were questioned by researchers earlier this month. Of the non-smokers involved in the survey, 37% said they would be more likely to visit pubs and restaurants once the smoking ban was in place. Responding to the poll, First Minister Jack McConnell said: "We have to be realistic about this. There are going to be people who will be inconvenienced by the ban. "I think that while we will see some people resisting over the early days of the ban, the vast majority of Scots don't smoke. "The vast majority of Scots who do smoke want to give up." Mr McConnell said this was Scotland's "largest single step to improve its health for generations" and a day of pride for the nation. Health Minister Andy Kerr also acknowledged the significance of Sunday's action. He said: "As a smoke-free nation Scotland can look forward to a healthier future. "A future where Scots live longer, families stay together longer and our young people are fitter and better prepared to make the most of their ambitions." Dr Peter Terry, chairman of BMA Scotland, said the day would be remembered as "the time Scotland took a bold and politically courageous step". He added: "On behalf of doctors across Scotland, I thank the Scottish Parliament for introducing this legislation that will help save lives which, for too long, have been cut short by the deadly weed that is tobacco." The smokers' lobby group Forest, however, has condemned the Scottish Executive, accusing ministers of misleading the public over the health impact and economic costs of the ban. The group's Scottish spokesman, Neil Rafferty, said: "The ban will do nothing to improve the health of the nation, but it will give a warm glow to those who enjoy telling others what to do. "The anti-smoking fanatics will use the ban to victimise and stigmatise smokers even further. "They have used abusive and dishonest methods to make smokers feel bad about themselves, even comparing smokers to heroin addicts." Research conducted for Five Live by Scottish Opinion suggests 21% of smokers plan to ignore the ban. Those in their teenage years or early 20s were most likely to do so, the poll of 1,000 adults found. The Scottish Licensed Trade Association, which had called for a partial ban, fears 140 pubs could close and 2,500 jobs may be lost. Exemptions from the ban include designated rooms in some workplaces, including in adult care homes, hospices, offshore installations and submarines. 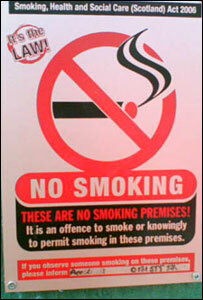 Smoking will also be allowed in police detention or interview rooms and in designated hotel bedrooms. Almost 300 business across Scotland have lodged planning applications this year alone for shelters, canopies or beer gardens to make last-minute alterations in the run-up to the ban. Individuals who flout the legislation face a fixed penalty of £50. The manager or person in control of any no-smoking premises can be fined a fixed penalty of £200 for either allowing others to smoke there, or failing to display warning notices. Refusal or failure to pay the fine may result in prosecution and a fine of up to £2,500.